“The history of the world begins in ice, and it will end in ice.” The setting of Elliot’s new fantasy series is a 19th-century England in a world trapped in a millennia-old Ice Age. After the fall of the Roman Empire, Europe dissolved into a mess of bickering city-states and principalities, a condition from which it has never recovered—but the real power came to rest with the powerful cold Mages and their dynastic, massively wealthy, Houses. But change is in the air. Technology and science—airships, rifles, and factories—threaten the Mages’ power, and the common folk are more than ready for change. Nineteen-year-old Catherine—aka “Cat”—is a member of the Hassi Barahal family, a long line of traders whose very minor wealth lies in the information they’ve gathered over the centuries. It’s not much, but it is enough to keep the family from freezing to death, and pay the tuition for Catherine and her cousin Beatrice at the local college. Cat’s aunt and uncle may be trading more than information, however. There are mysterious comings and goings at the house. It may have something to do with Cat’s explorer parents, killed in an accident when she was a small child. But before Cat can learn more, she finds herself claimed by the Four Moons House to seal a bargain made years ago. Forced to marry the cold Mage Andevai, Cat is desolate. Things get even worse when the Mages realize the Hassi Barahal have played them—and Cat, and Andevai—for fools. Not only is Cat not the true Hassi Barahal heir, she isn’t even part of the family. Everything she’s ever believed about her origins is wrong. Meanwhile, the House Mages want Andevai to kill her so he’ll be free to marry Beatrice. On the run for her life, Cat fights to survive and learn her true heritage. She’s determined not to be a pawn any longer, even if the truth turns out to be worse than she expected. After all, cats always land on their feet. But the truth could be far different—and more special—than anything she ever expected. Elliot has concocted something very special and original here, with elements to tweak scifi and fantasy fans of nearly any stripe, from alt history and steampunk aficionados, to lovers of intrigue, romance, and swashbuckling adventure. Cat and Andevai are both marvelously multilayered and believable, and their travels take advantage of Elliot’s deft world-building beautifully. 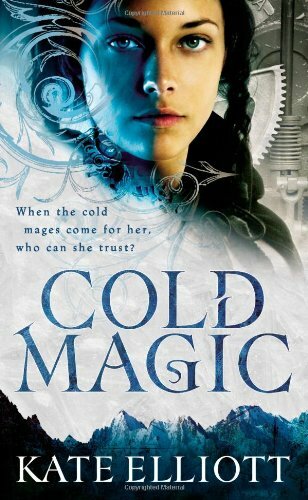 First in a promised trilogy, Cold Magic is the start of a series well worth sticking with.